Open studio hours are 12 noon to 6pm, June 2nd and 3rd. For one weekend, hundreds of artists and designers open up their studios to the public to showcase work in a wide range of mediums. From paintings, sculptures, film, photography, weaving/textiles, ceramics, and more, there are seasoned artists to be visited and emerging artists to be discovered in the northernmost tip of Brooklyn. Richard's studio is located at 61 Greenpoint Ave. Suite 401 in the historic "Pencil Factory". "Water" Drip on paper 22x15"
For more information visit 212Arts on Facebook. 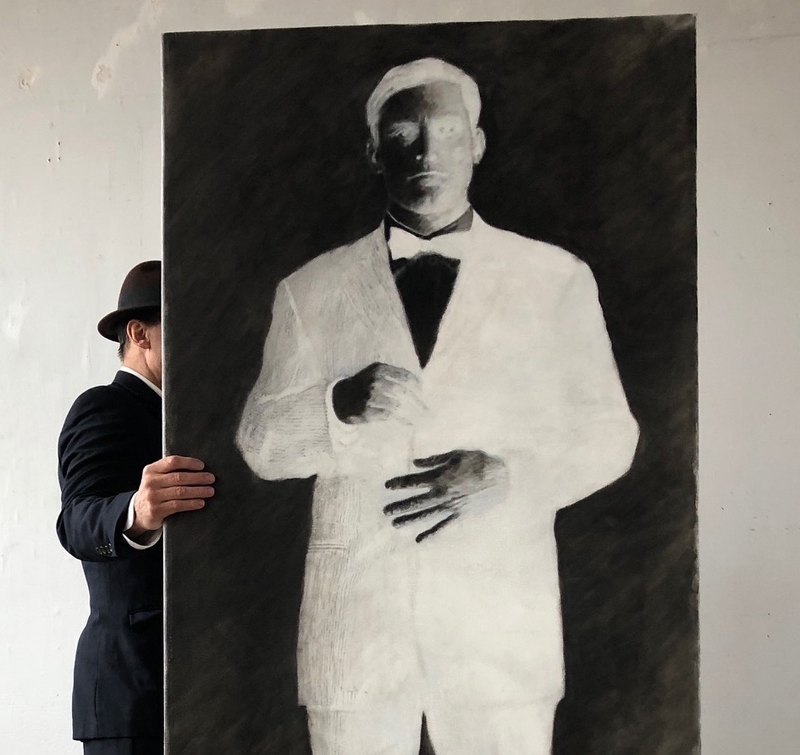 212 Arts is pleased to present a solo exhibition of Paul Richard’s work entitled “Negative Man”. The exhibit marks the first occasion that Paul’s vivid portraiture will be in dialogue with his street work. While his portraiture is elaborate and cerebral, his street art possesses a playful sense of spontaneity and quickness as he manages to capture the quintessential short-hand features of his subjects with nothing more than a dripped contour line of paint. Paul’s sidewalk drips have been captivating New Yorkers for over 25 years and have endured with lasting popularity. The recognizability of his work is a testament to Richard’s creativity in and out of the gallery and as such has earned him accolades in such publications as The Wall Street Journal, NY Times, Vogue, the Huffington Post, Architectural Digest, and Time Magazine. His collectors have come to include: Marc Jacobs, Beyonce, Jay-Z, John Varvatos, Justin Bieber, Elton John, Gerard Butler, and Christina Aguilera among many others. His work is also in the permanent collection of the Museum of Fine Art Boston and the Fisher-Landau Museum to name a few. Paul will be featured at The Other Art Fair, present by Saatchi Art. The three day event is at the Brooklyn Expo Center from Friday November 10th to Sunday the 12th at 72 Noble Street (between Franklin and West Streets), Brooklyn, NY 11222. Richard's drips and oil paintings include the defiant Portrait of a Woman, 2017, Oil on Canvas, 64 x 42 inches. Paul Richard is honored and delighted to welcome the public to his Brooklyn work-space as part Greenpoint Point Open Studios 2017. Works in various Richard styles (oils and drips in particular) will be on display along with quite possibly a cheekier work especially for the event. Paul with a drip of the Chrysler Building as formidable as the edifice itself. The work will be among the drips — large and small — on display and for sale Saturday and Sunday. Untitled 77 1/2" x 34 1/2"
While the drips have gotten much of the attention in 2016 and 2017 (including acquisitions separately for pop stars Jay Z & Beyoncé and Justin Bieber), the studio will be well adorned with Richard's classic representation oil work. One beloved piece features the artist and his dog Ranger posing before thick red drapes. The painting is a favorite of Richard's and he keeps it in his private collection. Untitled (Paul and Ranger) 50" x 60"
'Bucket Man' between Ellison's bay windows looking down on Los Angeles. Richard's austere and solemn portraiture style has become a mainstay of the New York City Surrogates Court. The court has commissioned Richard to commemorate two retired judges to date. A video from the installation of a portrait for the Hon. Marie M. Lambert. The portrait of a second retired judge in progress. Kate Orne's charming portrayal of New York artist Paul Richard captures the artist in his studio as he reflects on his life, from the benefits of exhibiting in Kmart to the impossible demands that sometimes come with portrait commissions. Transcending its own stylization, not to mention that of the artist himself, Kate's nostalgic vignette peels back a thin layer of paint to reveal the tattered canvas that is an artist's heart. Several works whose humble beginnings were on the streets of Soho have shown up in various publications adoring the walls of celebrities as diverse as Christina Aguilera and Gerard Butler. Richard can's say for sure who or for whom the works purchased, but clearly his art has many times caught the attention of elite interior designers. The kinds of designers that appear in Vogue or are hired by the A-list glitterati. See the full article about Gerard Butler's loft in Architectural Digest. The work by the door is called 'Kai and Marcel'. A version of Richard's 'Superman' was spotted in a bedroom of Ms. Aguilera's California estate in The National Enquirer. (No web version could be found). The piece from the Superman series bought for Ms. Aguilera photographed in the artist's studio. In the Spring of 2009, as Bernie Madoff's Ponzi scheme was in its death throws, Richard painted a stunning "close-up" portrait reminiscent of the tabloid "mug shot" oeuvre. In fact, the inspiration for the work came directly from the iconic New York Post. In a case of self-referential circularity, an image of Richard and the painting on Eight Avenue in Manhattan's Chelsea neighborhood makes the cover of the New York Post itself. The conceit of the event was a silent auction on the street. Richard posted his phone number on a placard and courted bids for several days. A contemporary art museum, Fisher Landau Center for the Arts, was the high bidder and the work remains part of their permanent collection. This sale on the streets of New York was not a singular event for Richard who has regularly sells directly to the public in most unconventional of ways. To date, Richard has sold tens of thousands of dollars worth of art in this manner. Olga, 1997, Oil Paint and Mixed Media on Wood, 84 x 36 x 1 5/8ths inches. A new acquisition of the Museum of Fine Arts Boston featured in its Foster Gallery. On view September 11 - January 6, 2009. Gift of Ronald C. and Anita L. Wornick.